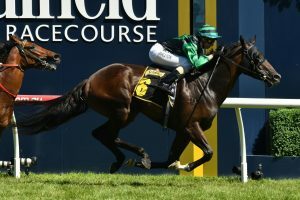 Super Cash will be freshened-up for the 2018 Robert Sangster Stakes after she returned to the races with an excellent win in the Rubiton Stakes at Caulfield this afternoon. It looked as though Super Cash would be a good thing beaten as she was blocked for a run throughout the straight and it was the veteran galloper Flamberge that kicked clear at the 250 metre mark. Jockey Craig Williams bided his time patiently and eventually found a gap at the 100 metre mark, which Super Cash exploded through to claim the Rubiton Stakes for the second year in a row. Super Cash has now recorded five wins from her six first-up starts and with that in mind trainer Andrew Noblet revealed after the race that the daughter of Written Tycoon will now be freshened up for the Group 1 Robert Sangster Stakes (1200m) in April. “She was going to be something beaten if she didn’t get out, but she got the run and she is just a dynamite mare,” Noblet said. “We gave her another run last time in, but this time I think that we will just go straight to the Robert Sangster. “We will give her a little freshen-up, a bit of quiet time and get her ready for the Group 1 in Adelaide. “I think that she has developed a lot more and she is a lot stronger. “Craig Williams commented to me at trackwork the other day about how much she has developed and she couldn’t have spelled better during that short break she had. Flamberge produced a typically tough effort and will go into the Oakleigh Plate as a genuine contender, while Merchant Navy lost no admirers with a fast-finishing third and he is on track for the Newmarket Handicap.